I love muffins and will take them over cupcakes any day (which is funny since I love frosting and that's often all that separates the two). I've made this recipe before without Allspice and called them "Snickerdoodle Muffins" for my Snickerdoodle-loving brother. I'd never tried Allspice before but really liked the flavor of these muffins (it reminded me of cloves), especially with the subtle, clean taste from the lemon zest. I guess it goes without saying that my son LOVED these muffins since he couldn't hardly keep hands off them (and now you can see that tried to use my rug as a back drop, my apologies). You can find the recipe here, on page 16, or at Kayte's blog. I'd suggest making half the crumb topping, not overfilling the muffin tins, which you should well grease (I should have made 15 or so instead of 12), and using cinnamon or nutmeg if you are scared of the allspice. Really though, I'd spring for a new jar next time you're at the store. And if you're feeling sneaky- sub half the flour for whole wheat flour and with the spice coloring the muffins, your husband will be none the wiser. See the other (surely more beautiful) versions at the Tuesdays with Dorie site. 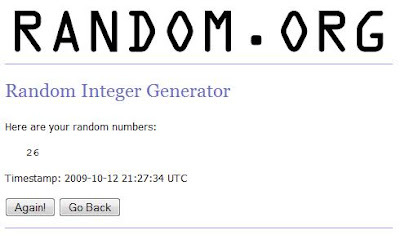 I also have the giveaway winner to announce. Congrats Liz (I want the recipe for your vanilla cream, by the way) and thanks to everyone for their yummy snack suggestions. I'm going to try to implement some of them because as much as I wish muffins and pudding were the perfect snack, they aren't going to get me into my skinny jeans any time soon! And you all know that isn't going to stop me from making them both, haha! allspice muffins ! COZY ! hugs to the babies, love AUNT QUEEN B !!!!!!!!!!!! and let's not talk about getting into skinny jeans. oy. Great photo of your son and plate of muffins! What a cute boy! They grow so fast, mine are already teenagers. Someone used an extra large muffin liner. It kept the topping in its place. This is my kind of muffins. I love the crumbs. The snickerdoodle idea sounds wonderful too! Great muffins and glad your little boys loves them. Those look great - I'll have to try the sneaky whole wheat version next time! Muffins are so easy and tasty! They are perfect for little hands. I'm a muffin lover too. I agree on the topping. I had WAY too much leftover. It all kind of spilled out when the muffins overflowed a tiny bit. Love the pic with your son! Too cute! 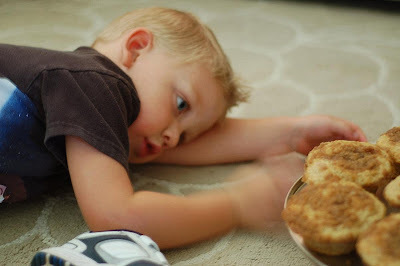 Great looking muffins and very fun photo of your little boy...I miss those days when my boys would lay like that on the rug, brings back good memories. Thanks for baking with me this week...love your idea for subs, etc. Wow - I barely got 11 muffins out of this recipe! Wonder what happened? And they definitely were NOT diet food! Love the photo of son gazing lovingly at these works of art. Nice job. I loved the muffins..
Adorable! I think you're right about reducing the muffin size; mine worked much better when I did that. Congratulations on your Kate. I have a granddaughter, Kate, who is absolutely a princess in the making. In fact, I just finished making her two "princess" tutus and ribbon crowns...she couldn't decide which color she preferred. Nana, of course, had to make two so she could have a choice:) Your blog is precious. I'm enjoying reading it. I host a weekly blog event called Crock Pot Wednesday and would love for you to link a favorite slow cooker recipe. As a new mom, I'm sure you can use a crock pot recipe or two:) Again, congratulations. I love the idea of the cinnamon in substitute of the allspice! I made the muffins this go around with allspice, but "Snickerdoodle" muffins sound to good to pass up! Woo Hoo! I love winning things! I love muffins and expecially spice muffins with crumb topping. Fall is the perfect time to break out the muffins! Split Level Pudding and a giveaway!